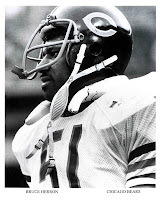 Bruce Herron, a former Chicago Bear, and active business leader in the Chicago region, is just one of the speakers participating in the November 15 and 16 Tutor/Mentor Leadership and Networking Conference, being held at the Olympia Fields Country Club in Olympia Fields, Illinois. "Two Kids.Five Days. We're living in a crossfire." The front page story in today's Chicago SunTimes was about the senseless shooting of two more Chicago kids. One was 10. One was 13. A quote with the front page headline reads "We are becoming veterans of doing this. Too many young people are dying for stupid reasons." In one of my email messages today one of my former volunteers contacted me. She reports that the student she worked with has had one baby. Her sister has had two, maybe three. Both are under 18. The only good news about this is that the volunteer is still in contact with the teen mother, and with Cabrini Connections. We don't have magic to prevent kids from making decisions that make their life more difficult (or end it), but we can build and sustain an adult support network that will be available as these kids wise up and look for alternatives to the bad decisions they have made. That's what the conference on Monday was all about. Alternative Schools Network recognizes that there are almost 250,000 kids out of school, and out of jobs. Many of these kids are ripe for recruitment by street gangs, who provide a self esteem and reward negative behavior. There is no simple, or short term, solution. Another march in the streets, and another headline in the paper, won't change habits that have built up over many years, and many generations. The only solution I know is a difficult, long road. It's one of getting informed, and getting involved. We're hosting a tutor/mentor conference on Nov. 15 and 16. That's a place to begin to get informed, as is this blog and the links I post when I write articles. If people visited this blog as often as they go to church or another faith based institution, or as often as they read the newspaper, or watch TV, we'd have a lot more people who were well educated about the problem, and had a wider range of solutions that they could bring into their actions. However, getting informed, is only relevant if you also get involved. Visit the Chicago Program Links, or the Program Locator, and find a tutor/mentor program in Chicago, or another city, where you can become a sponsor, a volunteer, a leader, a network weaver, or a student. The more you stay involved, the deeper your commitment becomes, because it becomes more personal, and your knowledge becomes more sophisticated. As you build a personal understanding of how difficult it is to get kids to participate, stay involved, and to change habits, all of the information you can find on the internet can stimulate your creative side, and lead to new ways that you support a tutor/mentor program, or a youth, with your time, your talent and your dollars. There's a process to this. I wrote about it here. Establish a learning group at your college, in your high school, at your law firm, in your synagogue or mosque or in your business. Grow your understanding of the problem and the ways that you can be part of the solution. On Monday I attended a Statewide Summit titled Building a System to Re-Enroll Students who Dropped out of School. It was hosted by the Alternative Schools Network. Dropping out of high school without obtaining a regular high school diploma has a number of adverse labor market consequences for adults in Illinois, especially for men whose employment rates and real annual earnings have been declining since the late 1970s. On every core measure of labor market success, adults (18-64 years old) in Illinois without high school diplomas are far worse off than their better educated peers. Employment rates of adults (men and women combined) in Illinois during calendar year 2005 were only 55% for high school dropouts versus 69% for high school graduates and 82% for those with a Bachelor’s degree. As a consequence of their lower employment rates and their lower wages when employed, adult high school dropouts in Illinois had mean annual earnings of only $15,650 in 2005 versus nearly $23,000 for high school graduates and over $50,000 for bachelor degree holders. I encourage you to visit the site and read the full report. I'm a big fan of the Alternative Schools Network. Jack Wuest has been building this organization for more than 30 years. He can fill a room with political leaders better than most. I wish I could find a way to link his efforts more strategically with mine so that while we're addressing the needs of nearly 250,000 drop outs in Illinois between the ages of 16 and 24, we can also be developing prevention and youth mentoring strategies that reach young people as early as elementary school so we prevent them from becoming drop outs and do more to help the develop their full potential. While I was listening to the first panel, with Arne Duncan, Wayne Watson, Mary Ellen Caron, Jesse Ruiz, Geoff Obrzut and Therese McMahon, I looked around and saw more than 200 people. I wrote "How do they connect with each other, or the speakers, during, or after this meeting?" One of my frustrations for the past couple of years is that while some people can get a crowd in a room, they don't create ways for people of the crowd to connect well with each other, or with the speakers. My goal is that on-line forums would support face-to-face events, thus encouraging more interaction, and more application of the ideas from a conference in real world problem solving. As I keep working to develop the mapping capacity of the Tutor/Mentor Connection, one goal is to create a Google map showing the participants of specific events. 1) learn who is already working with these youth; what works, etc. During the Q&A with Jeff, the question of Truancy vs Drop Out came up. The task force is focused on those who have already dropped out, not those who might. Jeff gave a insightful definition. A Truant is a "part time drop out" while a Drop out is a "full time truant". As I listened to the focus on drop outs, and the goal of finding new money, my thought was "What is the strategy to build political support?" 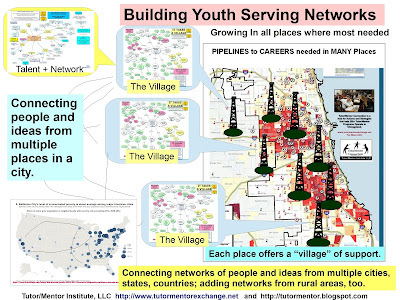 My goal of connecting tutor/mentor, youth development, prevention, workforce development and diversity into one goal of helping every youth reach a job is to broaden the base of people who have a self interest or personal connection to the cause. Senate President Emil Jones was the keynote speaker. He received an award from Alternative Schools Network and lavish praise from Deputy Governor Louanner Peters, who introduced him. As he talked about the need for a "system to re-enroll drop outs" I wrote, "shouldn't we be talking about a "system to assure that all students, including dropouts, are starting jobs and careers by their mid-20s?" Such a system goes way beyond the thinking of No Child Left Behind. Jones talked about his youth experiences and the discipline teachers were able to administer, saying "They weren't trying to hurt me; they were trying to get my attention." That's a lot more difficult in today's environment. Following Senate President Jones, was a panel of state representatives and state senators. As Kim Lightfoot, who represents the 4th district, spoke I wrote this note "Is the question one of how to reduce drop outs, or re-enroll dropouts" or "is it one of "how to prepare more young people for 21st century careers?" I reflected on my role at this point in the forum saying "my role is a catalyst. I have limited time to meet people in one-on-one settings. By putting my ideas on the Internet, like I'm doing now, I hope to stimulate the involvement of thousands of people. I visited the Alternative Schools Network web site this morning before writing this. It has great information on the demographics of drop outs and a database of organizations working with youth who have dropped out. I don't know how much traffic the site gets, but I hope by writing about the forum and posting the web site, more people will find the site, the research data, and locations where they can get involved as leaders, donors, volunteers, etc. My goal of networking with ASN and others is that they can draw attention to my sites and tutor/mentor programs, just by putting links on their site, or pointing to this sector when they host their events. Unless we expand the number of people visiting these sites, reading the research, then finding ways to act, not just as a voter, but by voting with their feet, their dollars, and their time, we won't dramatically change the system of supports for kids who are at risk of being drop outs, or who have already become drop outs. Why Participate in Tutor/Mentor Conference? Visibility, Dollars, Ideas. 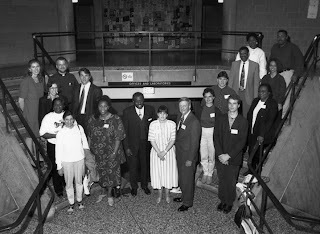 Tutor/Mentor Programs in Chicago who received Lend A Hand Grants at the May 1996 Tutor/Mentor Leadership and Networking Conference. I sent an email to the leader of one of the more sophisticated tutor/mentor programs in Chicago today, and decided to share that letter with the world. I hope you'll read it and make time to be part of the November 15th and 16th Tutor/Mentor Leadership Conference being held in the Chicago suburbs. I hope all is well with you and that you've submitted your proposal for the 2007 Lend A Hand Program grants. The size of the grant pool this year is close to $200,000, which is a huge increase from previous years when it averaged around $35,000. This means you and others who operate volunteer-based tutor/mentor programs in Chicago will receive larger grants this year, and for the next 10 years (because that's how long the LAH grants should continue at this level or higher!). This is exactly what I've been trying to make happen since 1993 when we formed the Tutor/Mentor Connection (T/MC). The Lend A Hand Program received a $2 million award last November, focused on funding volunteer based tutor/mentor programs in Chicago at a much higher level than in previous years. This was not an accident. It was the result of a concerted effort by several members of the legal community, which started in 1993 and 1994. With much more money to award, it will be a challenge to keep LAH funds focused on general operations of volunteer-based tutor/mentor programs in Chicago, but if programs are to grow, and more programs are to start in areas without such programs, we'll need consistent funding from the LAH and we'll need similar funding from other business and philanthropy sectors. It will take the combined efforts of leaders of many tutor/mentor programs to keep the LAH group focused on funding general operations of volunteer-based tutor/mentor programs, and to encourage other industries to duplicate their lead .... in Chicago, or in other cities. That's something I would like to talk about with you. That's something I'd like to be talking about with leaders of tutor/mentor programs throughout the country! In order for leaders in other industries to duplicate the Lend A Hand program, they need to know about this and know why they should become involved. At the Nov. 15 and 16 conference one of my board members, Steve Miller, President of Legacy Mortgage Corporation, is hosting a workshop titled "How business leaders can and should participate in charitable organizations". I hope leaders of tutor/mentor programs in the Chicago region, and in other cities, will encourage one of your board members to attend this workshop, and this conference. We also want health care people to participate. Last month, I wrote an article titled: Reframing School Drop Out as a Public Health Initiative. Some programs, such as Chicago Youth Programs, Inc, are wonderful demonstrations of health care involvement in a tutor/mentor program. If these programs host a workshop, or a display table, to show how they have built hospital and health care support, and invite leaders from hospitals in the entire region to attend, this can lead to others duplicating this type of support in more places. I also hope you'll do a workshop on evaluation. In order to keep money coming to volunteer-based tutor/mentor programs we need to develop some outcomes that business leaders understand easily. As you can see from articles like this, I feel that if industry looks at a tutor/mentor program as part of a workforce development, or diversity strategy, they will invest more creatively and consistently. I think you're further ahead than many on this, which is why I keep inviting you to share what you know vis the conferences. Having you part of the conference helps with our efforts to motivate people like LAH to support tutoring/mentoring. On the conference web site you can see you can see photos from past conferences where LAH is giving grants to tutor/mentor programs. 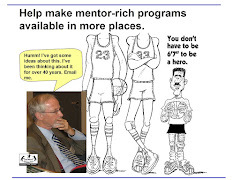 I know this is a busy time for leaders of tutor/mentor programs, but the rewards from what the Tutor/Mentor Connection has been doing for the past 14 years are beginning to show up in the increase of funding from a variety of sources. all over the region. If other cities duplicate this, and collaborate with each other, we can influence this growth in cities throughout the country. If you cannot come to Chicago for a conference, connect with us on-line in blog exchanges, discussion forums, webnars, etc. If you host your own event, link to the T/MC conference, and to web sites of others who also host events. By doing so we create greater traffic of potential volunteers, donors and business leaders through a network of linked organizations. This is essential for building the type of public awareness needed to gain more consistent support for comprehensive, long-term tutoring/mentoring programs operating in high poverty areas around the country. I'm part of a Non-Profit Blog Exchange this week. What's that got to do with the Rev. Jesse Jackson, Public Housing in Chicago, or former Mayor Jayne Byrne. The story on page 5 of the Chicago Sun Times today is titled "Jackson rips cops at housing complex". The photo shows the Rev. Jesse Jackson with a family at an apartment in the Harold Ickes development on the near South Side of Chicago. The goal of the Rev.Jackson is to draw attention to the needs of residents living in public housing. He along with 20 area ministers distributed 500 turkeys and other food items and drew attention to the harassment by Chicago Police of residents inside the development. In one quote, the Rev. said "We intend to break up the Gestapo-like techniques used in this area." Jackson moving into a housing complex reminds me of how Mayor Jayne Byrne did this almost 27 years ago when she moved into a Cabrini Green apartment at a time when gang violence was surging in the the area. I was leading a tutor/mentor program serving kids in the Cabrini Green area at that time and I remember it well. In fact, a few days prior to the Mayor moving in, I was at a meeting of several church leaders who were talking about what could be done to stop the violence. I remember telling them, "why don't you call on members of your congregations to be leaders, volunteers and donors who support tutor/mentor programs as an alternative to involvement in gangs in these areas." Or, "why don't you vote for elected leaders who do more to make such programs available. To my knowledge none did much of this, and the Mayor moving into a Cabrini Green apartment did not do much to help my tutor/mentor program get volunteers. I'm not sure anything has changed and that Jackson going into Ickes is going to lead to a faith based effort that draws volunteers, leaders and donors into tutor/mentor programs in the 60616 zip code where the Ickes complex is, or to any of the other high poverty neighborhoods of the city where tutor/mentor programs are needed. It would be great if when the Rev. Jackson calls attention to the problems of the neighborhood he'd point to the Tutor/Mentor Program Locator and say "search the 60616 zip code, sorting for tutor/mentor programs, serving junior high, or high school youth, and see what programs you can find." If you do this you'll see six that offer some form of tutoring and/or mentoring to junior high school kids, and just one Boys & Girls Club offering any type of mentoring to high school kids. That means the neighborhood has few alternatives for its kids in the non school hours, other than gangs or hanging out. If you search other zip codes you'll find even few programs in some areas, and more programs in other areas. There should be good programs in every high poverty neighborhood, for every age group. When leaders begin to put this message into their own communications, pointing the people who listen to them to places where volunteers and donors are needed, we'll begin to get more consistent support for these programs. That brings me to the Blog Exchange. A Blog Exchange connects me with another blogger, who I've never met. We look at each other's web sites and write something about what the other is doing. One of my past blogging partners was the Smart Communities blog. As a result of a first introduction, I'm now a contributing member to the Act Now wiki hosted by the Pew Partnership for Civic Change. This led me to organize my own blog exchange around the conference I host in May and November. I'm always learning new things when I read what other bloggers are writing. This time I'm matched with Kivi Leroux Miller's Nonprofit Communications Blog. This was a surprise to me, because this is the blog I point to on my own blog as a path people can go to and learn more about fund raising, philanthropy, marketing, etc., by reading what these bloggers write on their own blogs. Kivi's blog is loaded with good ideas for how to get a message spread to many people. The blogs she links to have a wealth of additional good ideas. When I visited her blog today I found a section I had never seen before. It's a "how to" for non profit bloggers. Great stuff!! I'll bet she could condense this article to have the size with twice the impact. I hope she tries. So what does this have to do with Rev. Jackson and Public Housing. My goal is that many people are using their visibility and writing ability to talk about ways we can solve poverty by building and sustaining comprehensive, volunteer-based tutor/mentor programs that mentor kids through school and into jobs and careers. Every time a leader points to the problem, they should point to a solution, just the way Kivi and other bloggers point to web sites of other non profit bloggers. Every time a tutor/mentor program is featured in a news report, they can draw attention to every other program if they just finish their interview with "look here for more information" and point to a web site like the T/MC that links to many other web sites. Not every tutor/mentor program is equally good at telling their story. I'm over 60 and my writing habits are pretty well set. The only way I can tell my story better is that good writers take me on as their own community service, and tell my story for me. Thus, if students in high school writing classes or college journalism or marketing courses adopt tutor/mentor as a cause, they can spread out and tell the stories of tutor/mentor programs in their city on a daily basis. This adds up to a growing public awareness that leads more people to be volunteers, leaders and donors in more places, at programs that end poverty, one child in a job at a time. If you're a Mayor, or pastor, point to the tutor/mentor programs in your community the next time you are delivering a sermon. The Smart Communities blog has started a Creative Economy 101 discussion. It references an article in Business Week that I encourage everyone to read, especially the people in industry who are concerned about skill shortages and/or diversity in their workforce, or those people who think kids should be learning to think, innovate and solve problems in public schools, rather than correctly answer the questions on standardized tests mandated by NCLB. As you read this, thinking about ways the accumulated knowledge of tutor/mentor and business leaders could have a growing impact on building and sustaining connects that influence the choices and habits of young people as the grow up and choose careers. Think about the role leaders in industry might take to support the growth of such places in all neighborhoods where they do business, where they have customers, or where families of employees live. How would Jesus, or ML King have worked to solve this problem? I wrote about this here, and here. Tipping Points - what are the actions individuals, organizations might take to assure that more youth are entering jobs, careers by age 25? Theory of Change - What results to we hope to achieve from our actions? Role of Leaders - what role can business, faith, university and hospital leaders take to achieve this vision, and meet their own workforce development and diversity goals? Process Improvement and Innovation knowledge base - visit these links and learn from the same people we learn from. A couple of days ago I wrote an article about a forum I attended, during which leaders of manufacturing companies talked about workforce development issues. What I'm concerned about is that business leaders seem to be competing for youth who have reached 10th or 12th grade with the grades and social skills to be able to succeed in an apprentice program, or in a college track. I think that with the shrinking workforce and competition for skills workers, there won't be enough of these young people to feed the huge economy, and that unless business leaders develop strategies that reach inner city kids, as early as elementary school, this group of young people will continue to drop out before they reach the stage when they would be able to become an apprentice or enter college. Even kids who do graduate from big city public schools may not have the critical thinking and problem solving skills desired by industry, because of the education and policy emphasis of teaching to the tests. 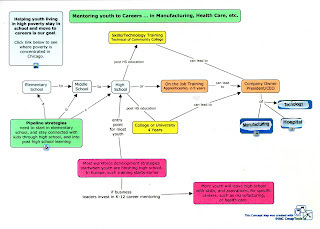 I created a map illustrating my vision that companies encourage volunteers and customers to connect with kids in non school tutor/mentor programs, and that these programs be challenged (and funded) so that they can provide a wider range of enrichment, learning and skill development activities, to go along with tutoring and mentoring. I'm hosting a conference on November 15 and 16, and I hope business and health care leaders will attend, to discuss ways they can use their resources more strategically to support this pipeline to careers strategy, in multiple locations throughout the Chicago region, and in other major cities, not just in one or two locations. I hope you'll help me recruit leaders from tutor/mentor programs, as well as from faith groups, businesses, hospitals, colleges and civic groups to participate. I've been encouraging others to share their experience via blogs, and to use blog exchanges as a way of connecting our networks and drawing more visibility, volunteers and operating dollars to all of us. One leader to take this up is Robin Cox, who leads a program in Australia. His blog has great information, in fact, it's almost a training manual for anyone who is starting or leading a program. I hope you'll take a look and read it often. These are the types of experiences we try to share at the Tutor/Mentor Leadership and Networking Conference we hold in Chicago. If you're able to participate, the next one is November 15 and 16. I'm still looking for workshop presenters, so please share your time and talent. Is College the Only Path to a Rewarding Career? I attended a conference in Chicago today titled Mobilizing to Attract Skilled Workers to High Tech Manufacturing. This was a Program of Swiss Business Hub (USA), the Trade Commissions of Switzerland to the United States. The speakers talked about the critical skills shortage that will face the US and other countries around the world as their populations shrink over the next two decades and as the baby boomer retire. Dr. Ed Gordon's book the 2010 Meltdown provides an excellent overview of this impending crisis. What was provoking is that many of these speakers talked as though there were a conspiracy of higher education and government leaders to channel youth from high school into college, while ignoring and under investing in high paid careers in manufacturing. I hope to write more about this later this week, but to start you thinking, here's an essay titled, A Career in Toolmaking or Machining Technologies: The Right Choice for Students, Community and Country, that I hope you'll read . At the same time, there was also a clear message that high schools, colleges and industry need to be working together on workforce development goals, for the good of the country. I remember a time around 1998 when I was in the office of Gerry Chico, the Chairman of the Chicago Board of Education. On his wall were 10 steps to school reform. Step 6 was "prepare youth for careers". I said to Chico, shouldn't that be steps 1, 2 and 3? He grabbed his assistant excitedly and said "He gets it! He gets it!" Unfortunately public education leaders and policy makers still don't seem to get it.